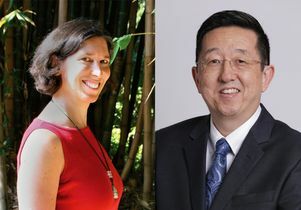 Nancy Wayne and David Yoo have been named ACE Fellows for the 2018-19 academic year by the American Council on Education. They are part of a cohort of 45 college and university leaders nationwide who will participate in the year-long leadership development program. As part of the fellowship, Wayne and Yoo will take part in retreats, visits to campuses and other higher education-related organizations, and placement at another higher education institution to condense years of on-the-job experience and skills development into a single year. During the placement, Fellows observe and work with the president and other senior officers at their host institution, attend decision-making meetings, and focus on issues of interest. Wayne is a professor of physiology in the David Geffen School of Medicine at UCLA and associate vice chancellor for research. She will complete her fellowship at the University of Redlands, working with President Ralph Kuncl and other executive leaders to strengthen her experience in finance and budgeting as it applies to high priority projects, as well as learning how those decisions are aligned with the university’s strategic planning process. Yoo is a professor of Asian American studies and vice provost of the Institute of American Cultures. The institute is the administrative home of four ethnic studies centers at UCLA: American Indian Studies Center, Asian American Studies Center, Chicano Studies Research Center, and the Bunche Center for African American Studies. Yoo will complete his fellowship at Santa Clara University working with Provost Dennis Jacobs and President Michael Engh. Established in 1965, the ACE Fellows Program is designed to strengthen institutions and leadership in American higher education. More than 2,000 higher education leaders have participated in the ACE Fellows Program during the past five decades.